One of the toughest Disney reality of being Between Disney is have a Disney bucket list that is difficult to fill. Schedules and geography make it very difficult to take in all things Disney parks. Yet, on that bucket list is Mickey's Not So Scary Halloween Party, which will continue to be debated in the Betweenland until the day the Between Family finally gets to attend. The Disney Festivals guide to Mickey's Not So Scary Halloween Party 2014 by Ken Bingham is a Kindle only offering from Theme Park Press. Bingham provides his readers a breakdown of the annual Halloween party including costs, planning, attractions, characters and entertainment. Along with text to help describe what a guest would experience, Bingham links to some of the finest Disney Internet sites to provide videos and resources that would help a first time visitor develop an expectation of their visit. And most of all since this is a hard ticketed event, Bingham helps you plan for how you will spend your time so you do not waste a moment of your experience. As a guidebook, Bingham is clear and helpful. The fact that he in a digital only format allows him to link to some of the best of the Internet. And it allows the reader to have instant access. The book is a whopping $2.99, a very safe investment especially for those going to the party for the first time. And it the book is available on Kindle Unlimited as a borrow. Even if parties of two or more just follow Bingham's advice on Sorcerers limited edition cards, the small price of the book would add to the party experience. 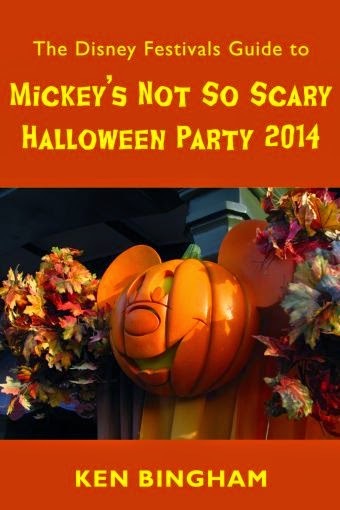 In short, The Disney Festivals Guide to Mickey's Not So Scary Halloween Party 2014 is an easy to use and cost affordable resource for those lucky enough to visit Walt Disney World during the Halloween season. But what about for everyone else. I am not going to the 2014 party. For me, it provided a nice overview of events during the party, what I'm missing out on. Bingham includes notes about past events and changes, what I missed out on. And now I know when I can see many characters especially villains I have not seen in the parks, who I am missing out on. For me it was a quick read that better educated me on the party and makes me feel more comfortable in fielding questions about a party I have never attended. Those attending this years Mickey's Not So Scary Halloween Party will want to pick up a copy of The Disney Festivals Guide to Mickey's Not So Scary Halloween Party 2014. For those in Betweenland still waiting for their first party, Bingham provides an informative guide with access to multimedia that may allow you to consider how to make your own Halloween a little more magical.